New Delhi: In a yet another warning to the United Progressive Alliance (UPA) government, social activist Anna Hazare in a letter addressed to Prime Minister Manmohan Singh on Saturday has re-iterated his decision to go on an indefinite fast beginning 27 December. Hazare has demanded that the Lokpal Bill gets passed in the winter session of the Parliament. The current session is scheduled to end on Thursday. In the letter, Hazare has enlisted a seven points on which the government has “cheated the people of the country" in the past one year. It includes the government favouring its own versio of the Lokpal Bill following a the deliberations of a joint drafting committee, presenting a “weak" Bill in the monsoon session of the Parliament and about Hazare’s arrest during his agitation in August. 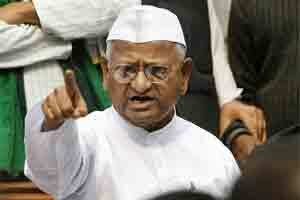 “There are a lot of shortcomings in the report prepared in the standing committee (on Lokpal)," Hazare wrote. A standing committee report tabled in the Parliament on 9 December rejected most of Hazare’s recommendation including bringing the Central Bureau of Investigation (CBI) and government’s Group C employees under the Lokpal. The veteran activist, along with an indefinite fast, has called for a “jail-bharo" (fill the jails) agitation. Earlier in this year, the anti-graft activist from Maharashtra, has gone on two “indefinite" fasts in the month of April and August in New Delhi. However, the venue for his December fast could be Mumbai instead of New Delhi if the “climate was not good", Hazare had told reporters on Thursday. Suresh Pathare, Hazare’s close associate, on Saturday wrote on the social networking site, Twitter, that Hazare would be present in the visitor’s gallery of the Parliament when the government will table the Lokpal Bill.